Blue and green laser diodes produce thousands of sharp beams. 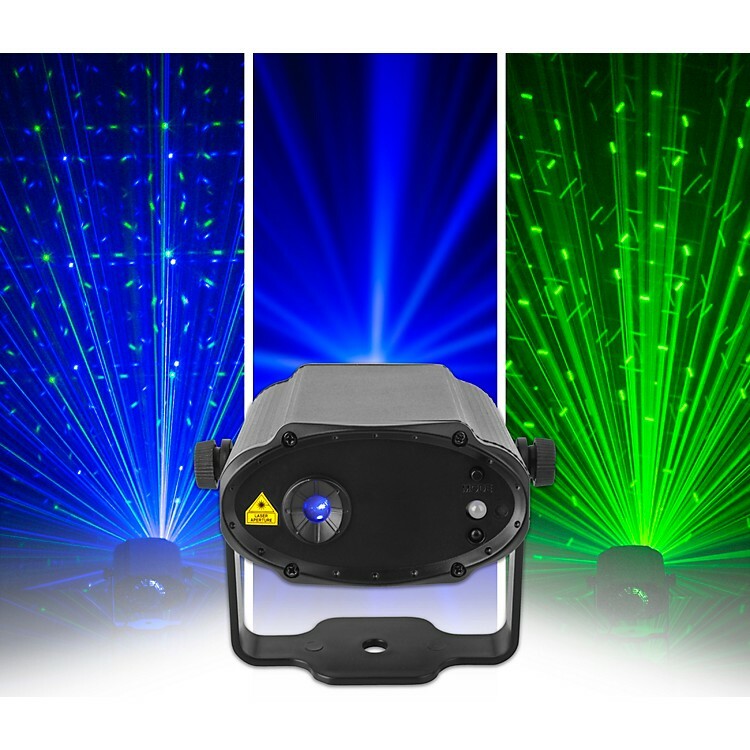 Projecting thousands of blue and green laser beams, the CHAUVET DJ MiN Laser GB produces crowd-pleasing effects over an ultra-wide area, and at a great distance compared to traditional lights. This dynamic fixture is a great asset for mobile DJs and other live entertainers on the go, who value high-impact lighting in a small, compact package. Even when used alone—and without atmospheric fog—the CHAUVET DJ MiN Laser GB has a commanding presence and puts on a visual display that is sure to illicit awe from your audience. Don't want to spend a lot of time fussing with DMX cables or programming an elaborate light show? The MiN Laser GB is ready to go, right out of the box, thanks to sound active mode and built-in automated programs. The included wireless remote lets you change the MiN Laser GB's color and rotation speed without having to step away from the DJ booth or off the stage. Don't be fooled by the compact size of the CHAUVET DJ MiN Laser GB; this little powerhouse will make you rethink how much lighting gear you take to your next gig. If you're looking for a single, compact fixture that provides total coverage of a large area, order your MiN Laser GB today.